A deposit, equivalent to the 1st-nights accommodation, is to be paid at the time of booking. Reservations cancelled 4 weeks or more prior to arrival - £10.00 administration charge, the balance of your deposit will be refunded. In the event of a "no-show"
The full cost of your stay will be payable and we reserve the right to pursue any outstanding balance. In the unlikely event that we are required to cancel your reservation, we will contact you immediately. Any payments made will be refunded in full. Should you wish to, we will attempt to book you into another local bed and breakfast of the same or better Visit Britain grading in a similar standard of room(s). Should this establishment be more expensive than your reservation rate, we will pay the difference for the first night of your stay. Our liability will not extend beyond these conditions. Guests are encouraged to take out cancellation insurance where required. We look forward to welcoming you to The Greyhound Hotel. Please take a moment to read our terms and conditions of booking below. Check-in is available from 4.00pm to 8.00pm (16:00 to 20:00) on the day of arrival. Check-in times outside of those specified must be confirmed with us prior to arrival. Please note the cancellation policy before committing to a reservation. In order for us to confirm a reservation, a deposit totalling the price of the first night's accommodation per room will be required. The balance of your booking will be payable upon check-in. Any additional items charged to your room, such as bar meals or drinks, will be payable on departure. Payment can be made by credit/debit card at the time of booking or by online bank transfer. Online bank transfers must be made within 12 hours of the booking being made to avoid auto-cancellation. Reservations made via an Online Travel Agent (i.e Booking.com, Expedia, LateRooms etc.) may have different booking terms and conditions. Please check these carefully. We do not provide Cots or Travel Cots for infants. A free car park is available for guests’ use at the rear of the property. Cars parked here are at owners risk. Please take care during your stay. You are responsible and liable for any breakages or damages which you cause to the accommodation or its contents. Please report these as soon as they occur especially if you accidentally spill something. Room rates do not include evening meals but do include breakfast. You are of course welcome to dine with us, the charges of which will be billed to your room or you may pay or your meal when ordering. In order to charge items to your room for settlement on departure, you will be required to provide credit /debit card details upon check-in. We reserve the right to pre-authorise up to £50.00 again the card details provided. Upon check-in, you will be provided with keys to your room and to the side door of the building (for access after 23:00). You have full responsibility for these keys for the duration of your stay. Lost keys will be charged at £10.00 per set. Pets are welcome to stay free of charge, however, guests are not to leave their pets unattended in the bedroom at any time and they are not permitted on the beds. Guests will be liable for any damage caused by their pets. Smoking is NOT permitted in any part of the building. Please note that offending guests may be asked to leave immediately and may be liable for professional cleaning of any rooms and any outstanding balance of nights booked but not taken through early departure. We reserve the right, at our discretion, to terminate, without notice, an individual’s stay where deemed necessary through unacceptable behaviour or as a result of actions which are likely to endanger or offend others (Please note that non-compliance of our non-smoking policy may constitute termination). In such circumstances, any outstanding amount must be settled, no refunds will be made. We are not currently VAT registered, therefore there is no VAT payable. We reserve the right to amend these terms and conditions at any time. You acknowledge and agree that all intellectual property rights (including, but not limited to, copyrights (including rights in software), trademarks, database rights, patents and inventions) in and relating to the service are owned by us and our licensors or contractors. Nothing in this agreement operates to transfer any such intellectual property rights to you. We reserve the right to assign or sub-contract any of our rights and obligations under this agreement without notice to you. If any provision of this Agreement is found to be unenforceable by a court of competent jurisdiction, the other provisions shall nevertheless remain in full force and effect. We would love to send you information about special offers and last-minute deals from The Greyhound Hotel by email, phone, post or other electronic means. We'll always treat your personal details with the utmost care and will never forward them or sell them to other companies for marketing purposes. No thanks, I don't want to hear about special offers and deals. 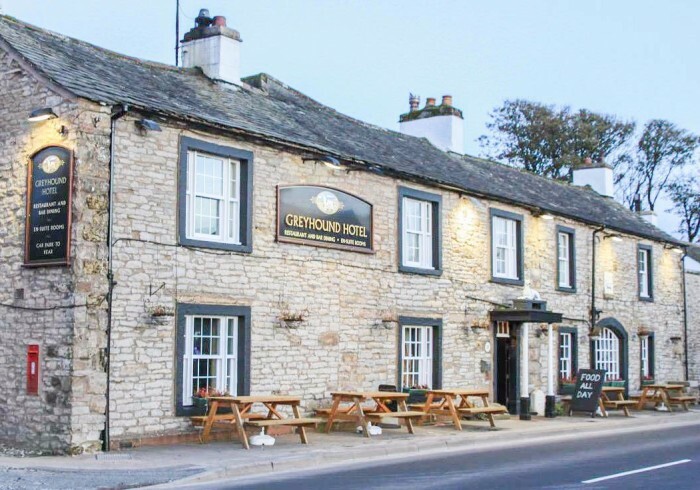 The Greyhound is set in a stone country house dating from 1680 and consists of 6 en-suite bedrooms, some of which still have the original wooden beams and stone walls visible. The large bar offers a selection of resident and guest ales as well as more well-known lagers spirits and wines. The Greyhound offers casual dining with the menu comprising of many fell-bred lamb dishes sourced from local farms alongside your expected pub classic dishes. We have both standard double rooms as well as superior rooms which are much larger. All our double rooms have hotel zip & link beds so they can be set up as either a double bed or two single beds. Rooms at the front of the building have views of the fells. Free Wi-Fi is available throughout the property via fibre broadband. In the morning, you will be offered a full Cumbrian breakfast. Pets are welcome at The Greyhound.